This recipe first appeared in Can It, Bottle It, Smoke It, but it is one that is a frequent request from my kids. There is everything to love about freshly-toasted baguette with a hearty schmear of hazelnut butter and chocolate. 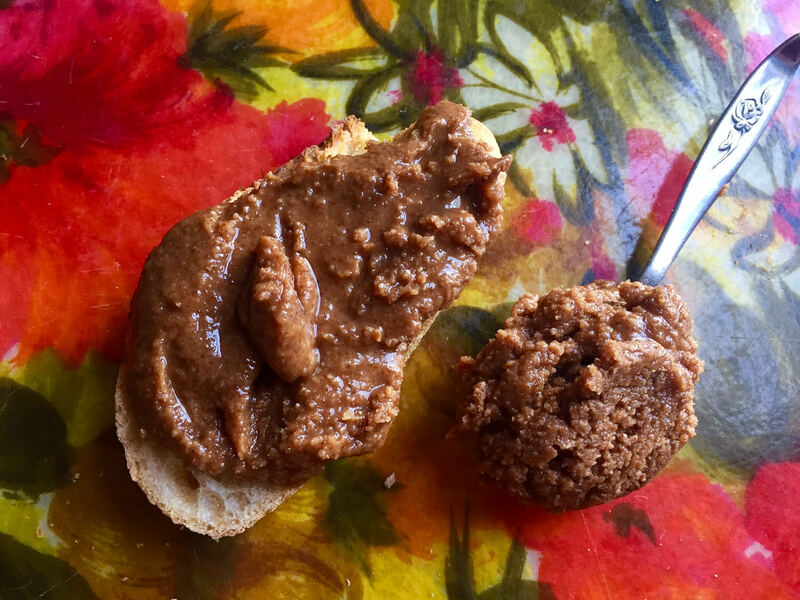 Spoon it, smear it, spread: there isn’t a wrong way to eat gianduja, the Italian blended spread of toasted hazelnuts and rich chocolate. Essentially, you make your own chocolate sauce and your own hazelnut butter, and then combine the two. Unlike the popular commercial brand Nutella, a science-fictionally creamy whipped concoction drenched with modified palm oil and emulsifiers, this homemade version actually contains food you’d want to eat — though it isn’t quite as shelf-stable. For the chocolate, I recommend something high quality like Valrhona, Callebaut, or Scharffen Berger over the standard chocolate chip. Note that a food processor is required for this recipe. Place a metal mixing bowl in the freezer to chill. Toast the nuts in a dry skillet over medium heat for about 8 minutes, until they’re light golden brown. Pour them into the cold bowl and stir for 1 or 2 minutes. When they are cool enough to handle, rub the nuts to peel off as much fo the outer husks as possible — don’t worry if they don’t all come off. Discard the husks. Allow the nuts to cool while you make the chocolate sauce. In a small saucepan over medium-low heat, melt the chocolate with the butter and sugar, stirring frequently, about 3 minutes or until smooth and well combined (note that the sugar will still be somewhat coarse). Take the pan off the heat and continue stirring for about 30 seconds to cool slightly. Stir in the vanilla. Transfer the nuts to a food processor fitted with the metal blade and whirl for 1 minute to make a thick paste. Scrape down the sides of the bowl; then, with the machine running, stream in the oil and continue to process for a full 5 minutes, until very smooth. With the machine still running, stream the chocolate sauce into the nut butter, using a rubber spatula to really scrape out the pan, and continue to whirl to combine well, about another 2 minutes. Add the salt to the spread and blend briefly to incorporate. You can eat the spread immediately, but note that it’s even better the next day. It will keep at room temperature for up to 3 days. For longer storage (up to 3 months), refrigerate it, removing it from the fridge for 1 hour before eating and stirring it well right before use.